Sharks have been swimming our oceans since the age of the dinosaurs. But these amazing animals are dying out and fast, due to the high demand for their fins. In fact, the environmental organization Oceana says up to 73 million sharks are killed every year. Many people consider the practice of finning to be very barbaric. Fishermen actually hack off the shark's fins and throw it back into the sea alive. The shark then slowly starves to death, drowns or is eaten alive. Environmental groups say poachers often enter protected areas to illegally slaughter sharks for their fins. One Costa Rican organization says enough is enough. CNN Senior Latin American Affairs Editor Rafael Romo has the story. It's hard to imagine enjoying shark fin soup after watching that graphic video, but there may be a cruelty-free alternative to the traditional Chinese delicacy. Here is CNN's Kristie Lu Stout with a Back|Story flashback from 2009. To feed a chicken that consumed half pounds of grain per day, consume 365 pounds of grain for two year. I prefer to have 365 pounds of grains than a two years old chicken. 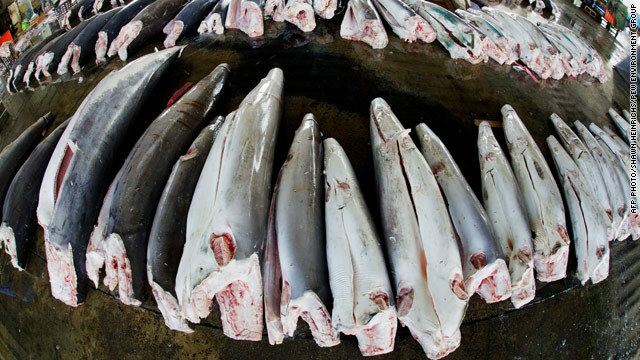 A shark consumed quarter of a ton of fish per day (estimated), i.e. 90 ton of fish per year. I prefer to have 90 tons of fish than to save a shark. To save the envelopment please, please, please kill the sharks not for fins, just for the 90 tons of fish per sharks per years. Hi Dan! Nice to hear from you. I'm sure you had a wonderful time in Las Vegas. I'd like to visit there, too. I was there in 1948, I think, when reathr young I do remember it being very hot. We checked into a motel and a couple hours later my mother went out to the car for something, grabbed the steering wheel and suffered severe burns on her hand!I had to laugh when I saw this photo. When you wrote of a shark tank I thought immediately of Wall Street and someone floating down the middle of it! Now, that's dangerous if your just a poor commoner! Margot – Hej Jonas.Dina bilder irseinprar mig otroligt mycket just av den anledning att det ge5r rakt igenom hje4rtat. Det e4r fe5 fotografer som lyckas fe5 till bilder med samma ke4nsla, ne4rvaro och helhet som du fe5r. Jag fotar mycket sje4lv och liksom du ff6rsf6ker jag skapa mitt egna fotostil. Tack ff6r dessa fantastiska minuter. You forgot to metnoin that The Debt is a remake of a 2007 israeli movie named Hachov (=the debt), which also aired last year on the Sundance Channel.I hope they didn't change the ending, keeping it non-Hollywood. One more thing it's so stupid when a character in a movie speaks english with a "foreign" accent instead of speaking in the native language just like X-Men: First Class did. X-men did it great -the excellent movie had english, german, french, spanish and russian and it all sounded authentic and it was logical. hey there and thank you for your info I've certainly piekcd up anything new from right here. tibia mc I did however expertise some technical points using this website, as I experienced to reload the website lots of times previous to I could get it to load correctly. I had been wondering if your web host is OK? Not that I'm complaining, but sluggish loading instances times will very frequently affect your placement in google and could damage your high quality score if ads and marketing with Adwords. Anyway I'm adding this RSS to my email and can look out for much more of your respective intriguing content. Make sure you update this again soon.. The movie actually shows the shark at vnayirg sizes, GREATLY vnayirg sizes. In this scene it is about twice the size of a plane.. In another scene it is about a quarter of the length of the Golden Gate bridge, and can fit its entire mouth around it. That means that in the bridge scene, the shark would actually be about 300 metres long, whereas in this scene it is about 100 metres long (very roughly, but you get the point). As an avid angler and a meebmr of society, I would have never imagined that anyone would have to be told to not stand in their own bait water nor to strap their catch to their waist. As for the individuals in the float chairs, think about what is going on under the near surface of the water that your floating on. If your escorts are spear fishing in close proximity, you might consider spending the day with a brighter group. Both attacks appear to have been avoided and all that were involved are very fortunate that their lack of thought' did not lead to bigger headlines. Earth is the insane asylum for the universe !!!!!!!! Toronto has recently passed law banning Shark Fin Soup. The vote passed 38 – 4.
sophina – it's crazy to me that while scrolling thogruh these photos i felt as though i was right there along with them, completely immersed in such profound love, joy and magic of that day. no other wedding photo i've seen has EVER brought me to that place, so thank you so so much for sharing these with us! it's a testament to how extremely talented you are. Tired of getting low nuebrms of useless visitors for your site? Well i wish to inform you of a fresh underground tactic that makes me personally $900 daily on 100% AUTOPILOT. I could be here all day and going into detail but why dont you just check their site out? There is really a excellent video that explains everything. So if your seriously interested in producing effortless money this is the website for you. – Dude. I found you after reading turghoh American Photo's top 10. This is stunning, truly inspirational imagery that makes me want to pick up my camera and try harder. Unbelievably mindblowing work my friend. Congrats on making the top 10 you definitely deserve every ounce of it. – I played Miya's song as I scrloled through these pictures and I felt completely transported. Your storytelling skills and artistry are so beautiful and unique to who you are Jonas. You really do have a gift. Not a fancy place at all! There's this food court at Jurong Point Shopping Centre (Boon Lay interchange) near Golden Village camenis. It's a small shop towards the outer extremes of the food court. Is this a common menu item in restaurants here or hard to find? If Costa Rican authorities and NGO don’t support the proposed measures intended to prohibit exportation of shark fins, which is where the big business stands, another 10 years of “campaigns” will be seen with no positive results. The U.S. Navy found that the color most easily seen from the air for ftieralfs, was also the color most easily seen by sharks, so it got the nickname of Yum Yum Yellow . I think that is when ftieralfs started appearing in orange. So I would think a dark orange would be a good choice.Sharks in the surf are very rare. When near they are very visible from the air, and West Coast beaches get a lot of fly overs. RockTheOcean4meI saw one white shark in all my dives. It came from the back and it was a meter away orso, then out of sight it turned and came stargiht towards me and my buddy with that grin. Max 10 m before us it took a 90 degree turn and disappeared. That was uhm, impressive at the least.The shark was followed by a baby so she could have done more to protect her kid but she didn't. I rather be under water then on the surface. Forget the teeth, if this 5m shark hits me, all my bones are broken. Every fisherman caught finning should be finned themselves. Arms and legs off with the knife they use on the shark. They should then be tossed in the water as chum. Very cruel. An international law should be passed banning this cruel act. This topic of cruelty to shark was discussed many years over and over again. Why? A real waste of time really. I take it as a racist remark towards the Asian, showing how cruel is the Asian catching and consuming it. If it is really so Bad, Why wasn't it Ban in many countries including USA (except for some state who ban it, good on them). The point is if you want to stop, you have to ban it. Don't keep talking. The shark will die by you just talk. I am very sure you still can have a Legal Shark fin soup in USA. The politician should take action. Anyway, I also I agreed with Shye comments. I saw a Discovery channel – Mike Dirty Jobs biting off the lamb testicles. Isn't it cruelty? Ya the difference is the Lamb is still alive while the shark is dead. Try getting an animal to chew off yours and see if it is painful. Threadless got way too big, way too fast. Every high school kid out there is wreniag the same damn shirts every day. And that cloud vomit design was done before, only with a clown vomiting a rainbow. Not unique in the least. I'm old. Gimme, gimme, gimme.